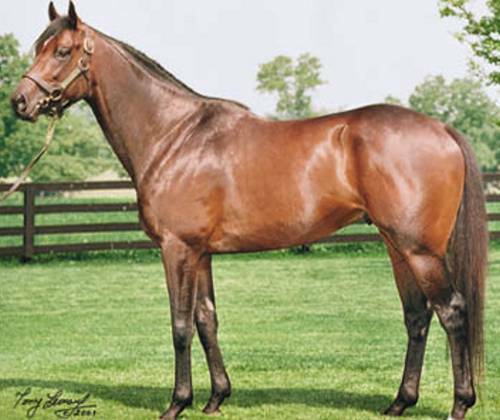 1997 foal, US bred and raced. Won 5 races from 6f to 8.5f between 2yo to 3yo. Won two Grade 2 races & the Breeders' Cup Mile at 3yo. To stud in 2001 and had produced Group/Grade 3 winners at best to late 2005 including the Nell Gwyn winner Karen's Caper. Well above average record with his 7 British raced 2yos in 2004-5 which have produced four winners. The wins have been at maiden race level, between 6f to 8f and mostly later in the season with none before August and the majority in October. Another good year in 2006 with 3 winners from 5 runners (7-8f) including the useful Rallying Cry. One yearling sold at Tattersalls in 2005 for 110,000gns and one in 2006 for 16,000.